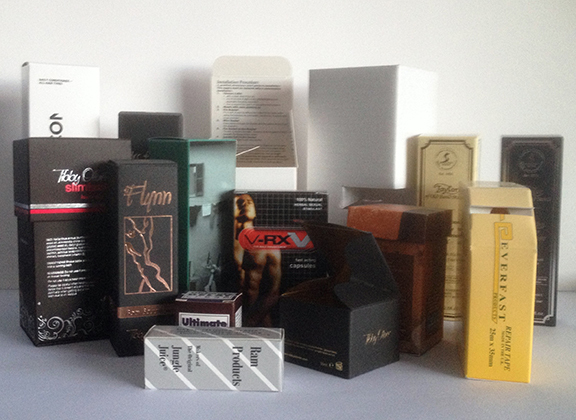 With our in house packaging team we are able to design cartons and packaging to enhance, protect and display your products, and with on site equipment and expertise we are able to turn these designs into finished products, be they simple plain cartons or multi coloured cartons carrying special effects such as foiling and embossing. As a customer you become part of the design process, it all starts with us seeing the product to be packed, our skilled packaging designer is then set to work to arrive at a mock up carton, once you like the concept it is then turned into a cutter, this cuts out the printed sheet into the designed design with all creases and flaps to enable us to build the carton, from there our in house team will assemble the cartons ready for the product. This is then used to cut the pre printed design into the required shape. Examples of the finished product.